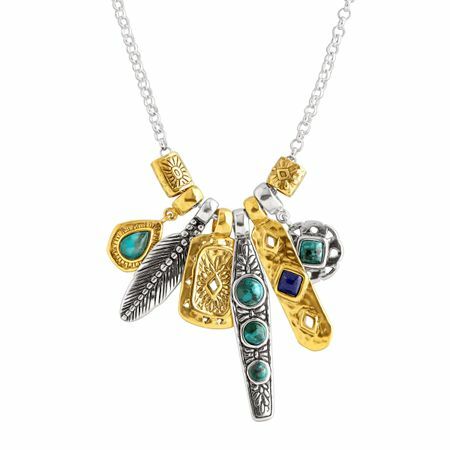 Featuring an eclectic mix of metals, colors, and charms, the Shore Thing Necklace features stones such as compressed turquoise and lapis, totaling 33 ct, and metals such as brass and sterling silver that contrast well with red shirts, white denim, and your other favorite solids. The rolo-style chain measures 32 inches in total length and is finished with a lobster clasp. Piece comes with a “.925” sterling silver quality stamp as a symbol of guaranteed product quality.